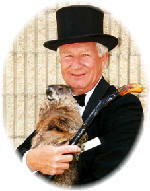 Groundhog Day is celebrated February 2nd in the United States. Groundhog Day comes from Candlemas Day, observed for centuries in parts of Europe on February 2 where the custom was to have the clergy bless candles and distribute them to the people. This seems to have derived from the pagan celebration of Imbolc, coming at the mid-point between the Winter Solstice and the Spring Equinox. The Roman Legions, it is said, brought the tradition to the Germans. By the 1840s the idea had caught on in the U.S., particularly in Pennsylvania whose earliest settlers were German immigrants. If the groundhog sees its shadow on a "bright and clear" day, six more weeks of winter are ahead. If the day is cloudy he does not see his shadow, he takes it as a sign of spring and stays above ground. Punxsutawney, Pennsylvania is the headquarters of the celebration where the groundhog "Punxsutawney Phil" regards his shadow at Gobbler's Knob, a wooded knoll just outside the town.